No, I hadn't heard of Sarah Palin either; or at least not until yesterday, when I read on some blog somewhere that hers was one of the names in the frame. But, if I were John McCain, she is the one who I would have chosen as my running-mate. In fact, she strikes me as not only the right choice, but the only plausible contender - unless there were another 40ish, relatively independent, middle-of-the-road woman available. She isn't black, but you can't have everything, I suppose. To counteract McCain's negatives, she had to be relatively young, and she probably had to be a woman (though he might have got away with a man who was black or Latino). In a campaign likely to be dominated by visuals as well as visions, it also helps that Palin has the looks of a former beauty-queen. Amazingly, some commentators have compared this surprise appointment to George Bush I's choice of Dan Quayle as his vice-president. Dan Quayle, as I recall, had two claims to fame. As a young man, he used his family connections to avoid being sent to Vietnam (a war from which John McCain returned home a hero); and in front of a class of schoolchildren he misspelled the word "potato". 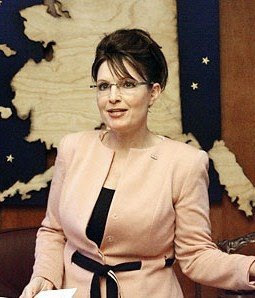 Sarah Palin, by contrast, has a son who is serving in Iraq, would appear to have an exemplary (if short) record as a Mrs Clean and, if she is little-known outside Alaska, that is doubtless Alaska's fault for being frozen and remote. She certainly looks to me like a woman who can spell "potato". One of the main dangers for Barack Obama, it has become evident, lies in the existence of unreconciled Hillaryites threatening to defect to the McCain camp. They've been little in evidence these past few days, as the Clintons (Bill more convincingly than Hillary, it must be said) declared for the winning candidate. Obama's big speech, oddly described in some quarters as workmanlike and underwhelming, went a long way towards answering the concerns of those, Hillary supporters above all, who thought he was full of hot air. It was one of the most impressive orations I've heard in years. Anything more rhetorical would have sounded overblown and corny, to say nothing of the open goal it would have presented to McCain. But then came this masterstroke. No wonder John McCain's video response to the Obama speech today was so unexpectedly generous: with the ace up his sleeve, the Republican could afford to overlook Obama's rather harsh criticisms. Sarah Palin is everything Joe Biden isn't: not experienced (but why does she need to be? ), not a Washington insider, not an old white guy. To Hillary's army of female supporters, who yesterday said "Yes, we can (just about)" when asked whether they could, after all, swallow their disappointment and lend Obama their vote, Sarah Palin presents an interesting dilemma. Do they vote for the candidate who promises many of the policies they want to see, or do they vote for the woman? A no-brainer, you might think, especially since Palin's traditionalist stance on abortion (thank you, Master Cranmer) is unlikely to be to the taste of many ardent feminists. But then there's the complicating factor of John McCain's age. The Republican candidate is said to be in good health, although he has suffered from skin cancer in the past (he has had four malignant melanomas surgically removed in the past 15 years). At 72 today, with a mother still living, he might reasonably expect to see out at least one term in office. But you never know. One report I found stated that he was diagnosed with stage IIA melanoma in 2000, and "a third of all Stage IIA melanoma victims die within 10 years." A few months ago, indeed, there was a wild speculation on some blogs that McCain would be forced to withdraw on health grounds before the election. That's not going to happen. Nevertheless, no-one would claim that Palin's chances of becoming president through the natural death of the incumbent are not substantially greater than Joe Biden's. Which brings me to my speculation. Not that John McCain is likely to die in office - that is unknowable - but, rather, that the Republican candidate, by selecting Sarah Palin as his running-mate, in consciously invoking that possibility. He is saying to those Hillary supporters who were flirting with abandoning the Democrats that voting for him would give them the best chance they may ever have (the older ones, especially) of seeing a woman as president. While publicly stressing his good health, he is holding out his possible death as an electoral inducement. This election will be fascinating.